Dame Kiri Te Kanawa backstage at the Kennedy Center with Yr Hmble Srvnt and WDAV supporter Catherine Connor. Next day I had an hour on stage with KTK hosting her “exit interview” at the New Zealand Embassy, courtesy of the Washington Performing Arts Society. (For all of her trips to DC this was the first time the native Kiwi had ever been there, and the Embassy folks were suitably thrilled!). A fascinating discussion that sadly was not taped (I know, I know, but those were the ground rules…). More later on our discussion. Three-Quarter Pole: Radio Chopin Episode 150…. Charles Gounod’s opera, Faust. Act One, Scene One: Faust sits alone, bitter, despondent, reflecting on a life spent in a futile attempt to find the meaning of existence. He resolves to take his own life and is raising a vial of poison to his lips when …outside a joyous peasant chorus stops him. So, for episode 100 of Radio Chopin, we thought we’d visit Chopin’s original home, in the Polish town of Zelazowa Wola. “Today, trees – and pianos – remain the story of Zelazowa Wola. The park surrounding the manor includes more than 500 species of trees and shrubs. Piano teachers make pilgrimages here to put “Chopin acorns” in the pockets of their promising students. Inside, there are three 19th-century pianos; outside, there’s a modern grand, where every summer, there is a daily Chopin recital, from soloists ranging from greenest amateur to the most established pro.” Nicely told, Mike McKay! 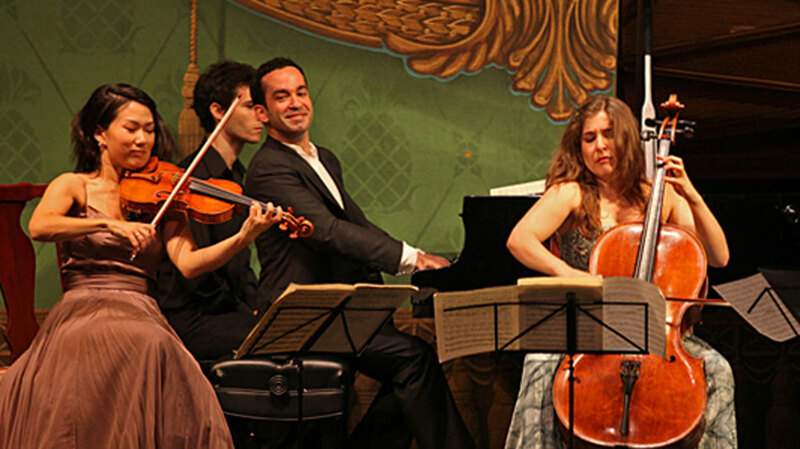 Fun story to write for NPR Music’s Classical pages about a great concert this Spoleto season at the newly-redone Dock Street Theatre, with a stellar cast including pianist Inon Barnatan, cellist Alisa Weilerstein, and violinist Livia Sohn…. Great dissection of how he channels Chopin into “the Mozdzer Motor” – and his John Cage-like habit of putting drinking glasses, combs, and even his own CDs on the piano strings to combat boredom. Oh, and along the way we revealed to Mozdzer his unwitting hand in creating the Spoleto Today theme song! Episode 50 of Radio Chopin considers the saga of the wonderful Argentinian pianist Ingrid Fliter…“My parents met through Chopin’s music. It was during a party. Fifty years ago. My father was playing — as an amateur pianist — some Chopin waltzes in a party and my mother was there and that took her attention! That’s why she got in love with him. And that’s…that’s the reason why I say that if it wouldn’t be for Chopin music I wouldn’t be here!” Check out the story…and why many consider her part of the new generation of Great Chopinists…here.